The countdown clock had begun at the command of Willie G. Davidson, the grandson of the founders of Harley-Davidson. 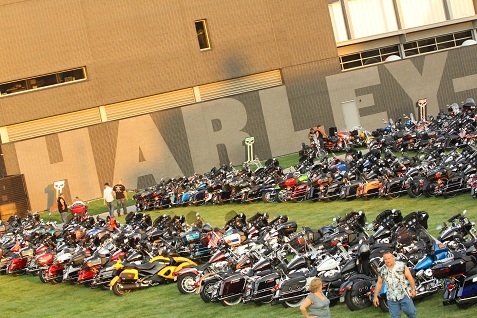 The year-long party to celebrate the 110th anniversary was officially underway in typical Harley-Davidson style with an appropriate blowout in the heart of Milwaukee and Bullz-Eye was invited to attend. 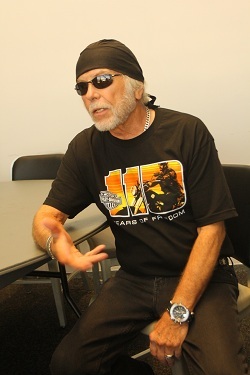 This included the launching of the festivities and a review of the 110th anniversary Harley models and the evolution of this true American icon. We arrived at the Iron Horse boutique hotel, which offers dream accommodations for bikers. This 5 star hotel resides in a converted 100-year old warehouse and was designed to cater to motorcycle enthusiasts by offering top-notch business services with never-before-seen rider amenities. Loaded with memorabilia and located across the river from the new Harley-Davidson Museum, it served as the perfect home base for enjoying the planned festivities. At the unveiling of the new anniversary models we saw the new and very eye catching Hard Candy custom paint scenes that we recently saw in the new Seventy-Two Sportster model now available as an expanded option in the Dyna and Softail family of bikes as well. The Street Bob now as been restyled, with awesome factory options, and Harley’s own in-house custom division, CVO, launches a new and very radical Breakout model. 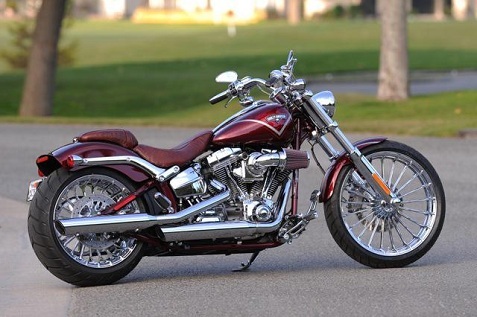 The Softail, Dyna and Sportster family of bikes will see the exclusive 110th anniversary editions, with cool, rustic badging included. In the CVO family, models with the 110th package include the Road King, Road Glide and the super top of the line Ultra Classic Electra Glide. The next day we were treated to a remarkable factory power-train tour where all the engines are made for every Harley sold world-wide. It’s hard to describe the massive size of this amazing factory, with 750,000 sq feet, equal to 17 football fields, under one roof. Clean, automated and fascinating, the tour is a must-see while in Milwaukee, and the basic tour is free, so you can’t beat that! Returning downtown we arrived at the remarkable Harley-Davidson Museum, the largest museum in the world devoted to motorcycles. This is the Mecca for any HD enthusiast, from the first HD bike made in a shed to fascinating 3D interactive areas and rider emersion activities. A half day can be spent here easily; it’s that big. You can see a photo of the East Rider Harley in the slideshow above. The museum also featured the “Worn to be Wild” leather jacket exhibit that celebrates the iconic black leather jacket. They had over 50 jackets on display, ranging from rare historical examples pulled from both the HD archives and private collections to those worn by celebrities. He was quickly ushered away by security to the 10,000 gathered outside. As the huge crowd cheered Willie on with the start of the countdown clock the Harley stunt riders burned 110th in to the museum sidewalk with a massive cloud of smoke. Willie definitely knows how to party, and you can join in or just follow the fun over the next year. Just check the Harley-Davidson website for the Rumble Heard “Round the World.